Well, it’s the fourth episode and I’m already frustrated and fatigued. But then so are the designers. Anybody out there watch the short-lived artistic competition Work of Art? It only lasted 2 seasons and it was ill conceived and absolutely absurd but also AMAZING and I LOVED it and it remains my favourite competitive reality series of all time. We dance round a ring and suppose. The secret sits in the middle and knows. Mainly because it represents the secret that sits in the middle and points out how completely arbitrary and orchestrated competitive reality series really are. In the second episode of season one a contestant took a nap during the gallery show (their equivalent of a runway show) and that ‘innovation’ won the challenge. And the artist went all the way to the finals. Something remarkably similar happened in this week’s episode of Project Runway. The Challenge: Create a new spin on a classic look, inspired by the New York City skyline. The winner receives not only immunity but $5,000 and have the look featured in an ad for Mary Kay Cosmetics. Designer: No one’s immune to testimonial cattiness (so, so orchestrated yo) but Ashley remains awesome. Look: It’s fine. Pretty. I sorta see the skyline? But it’s nothing we haven’t seen before, from Ashley or in general. Designer: I don’t remember anything he said this week. Look: Am I the only one who thinks she looks like a vampire? Kinda surprised this didn’t end up in the bottom due to “questionable level of taste”. Designer: I like her and I like that Candice likes her. Look: Cute if super ‘early 2000s’. Like that she chose something so simple to “spin”. Designer: Why doesn’t Laurie ever get any screen time? Why is Laurie always in the middle? Designer: There is a pattern with Merline where she is either the story or absent. Look: Okay, the jacket has a felt puzzle piece thing going on that I can get behind. But the shiny mess it covers is a shiny mess. A wrinkled, poorly constructed, even more poorly conceived, shiny mess. Look: …and resulted in a look that appears to have no ideas. I don’t hate it, but I don’t have anything to say about it. She scraped by however and can try to “be weird” again next week. Designer: Lindsey was more interesting when she was getting the villain edit. Look: In this shot it looks like really high end pajamas. Designer: Poor Gabi. She crashed and burned just as I’d finally learned who she was. It was super interesting to see her try to organize the nine hours — I mean nine hours is NOT ENOUGH TIME and I feel like this epi really highlighted that with even the people on top having to cut corners and leave parts of their look unfinished. Gabrielle’s look was completely unrealized and it’s sad. Look: The underdress is a disgrace and the reason she went home. The jacket had something going on but not enough to save her. Designer: She’s adorable. Had a great judging and got emotional about her family and is proving to be one to watch. Look: Love the dress! Love that it is a spin on a princess dress in black vegan leather! And the styling is perfect. My pic for the win. Designer: He promises to let the shiny loose in his final collection so he better get to make one cuz I need it. Until then he’s reigning it in per Tim’s advice proving Swapnil is not only talented but smart. Look: First Alice now Breakfast at Tiffany’s? Swapnil gets me. This dress is crey, but great and Heidi should wear it. Also I think his model is my favorite. Designer: So here’s where the innovative napping comes into play. We barely saw Blake cutting or sewing or working, the dress seemed thrown together in the end — and yet he won. The judges admitted that the construction was rushed and incomplete but didn’t care because the final effect was ‘surprising’. There was also a bit about him not knowing how to tell time but really he doesn’t know how to read an analogue clock. Because the world is digital. The other designers think the bit was staged which also reminds me of the conspiracy theory that napper Miles was playing a careful constructed character on Work of Art as a kind of performance art. Blake’s odd reactions to being in the top and then winning make me think he’s playing a role, too. 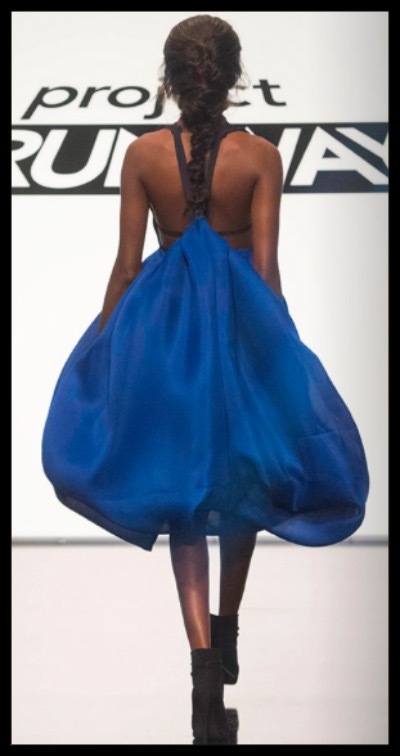 Look: They way the dress billowed behind the model as she walked was magic and it secured him the win. Blake is absolutely talented. But I ‘m bored with the story being told about and by him. I think that Swapnil’s dress was surprising in a similar way to Blake’s but his was made so much better. I was hoping he’d get the win and I was surprised Blake even placed. I hardly ever agree with the judges, and Blake fits their prodigy designer template, so I’m not surprised. But I’m pulling for Swapnil to get his due.